"WE USE LIGHT AS OUR MEDIUM TO DESIGN"
We 're experienced in designing interior and exterior spaces with light enhancing the environment. Temporary installations with the focus being light. Exploring ways to develop day-to-day platforms for those where light is a common interest. A playful and inviting sculpture for that ‘Instagram moment’. Reflective and vibrant; dichroic lenses form the “tips” to the wings which reflect and refract the light. This piece is inspired by the essence of light and the importance of natural energy in modern day society. Spiralling down the sculpture in a double helix structure, 128 dichroic glass lenses are positioned to reflect and refract the light from sunrise to sunset. The wind generated is stored and at dusk a series of 3W, 3000K LED uplights illuminate the Stainless steel and glass Sculpture. The piece signifies the importance of renewable energy and the effortlessness of powering and illuminating the work. Sculpture by the Sea runs from Bondi Beach to Tamarama Beach and is the world’s largest free to the public sculpture exhibition. 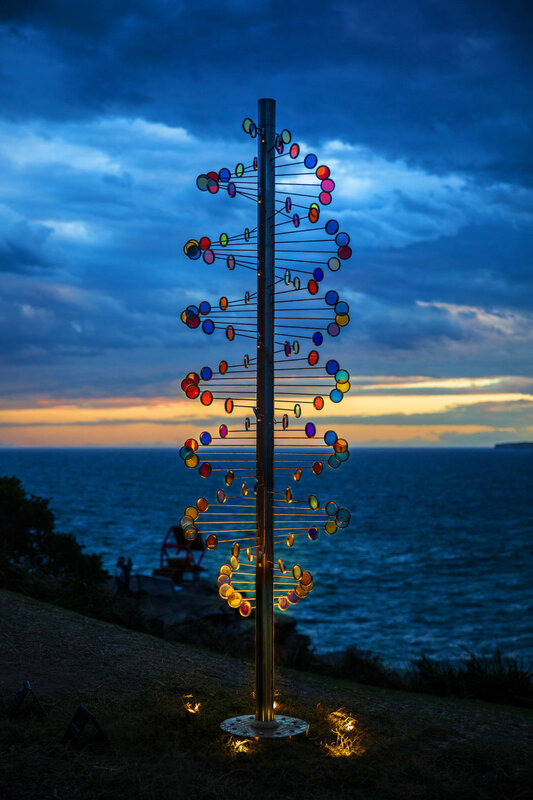 The spectacular coastal walk is transformed into a 2km long sculpture park over three weeks featuring 100 sculptures by artists from Australia and across the world. This October marked 21 years of Sculpture by the Sea and each year over 500,000 people attend the exhibition. Wind reflections was a collaboration with Nocturnal Lighting (Fabrication and illumination Twiggy Spike Lights), TILT Industrial design (Engineering) and iGuzzini (Sponsorship). “Feeding the Planet, Energy for Life"
This project chose to focus on the importance of the honey bee to global food production. The 'Hive' inspired structure formed the centre piece for the UK pavilion at the Milan Expo 2015. Rhiannon was the lighting designer for the project during her time working for BDP, Manchester, UK. The project was a collaboration between Artist; Wolfgang Buttress, Stage One and BDP. Working to an incredibly small budget, the lighting design came to life with integrated luminaires into the architecture wherever possible. Seamless lighting details and a glowing structure centrepiece to achieve maximum effect with minimal expense. Integrated handrail and skirt-mounted fixtures delineate pathways through the landscape to a bright feature wall full of information about bees—dubbed the Swarm. On the pavilion’s terrace, recessed fixtures beneath the floor add an overscaled honeycomb effect through backlighting. Clusters of custom hexagonal aluminum extrusions hang from the interior conference room’s ceiling to provide a soft amber glow. Light, art, science. A complimentary mix. And when given an eerie environment, it makes for an unforgettable experience. Subluminal is a sensory light experience where people walk through an environment whilst immersed in light, shadow, sound and bass. John Ryland's library was the first location of the Subluminal experience where over 800 visitors over 3 days saw the exhibition. Light illuminated architectural elements of the library. There were only 2 colours used throughout; white light and saturated red light. White light provided direction and highlighted important features of the experience - whereas red light formed a backdrop to the neo-gothic architecture the building had to offer. One evening illuminating a series of significant landmarks throughout the UK. 1st October 2015. Locations such as 'Tower of London', 'Durdle Door', 'Liverpool Maritime' were to name a few. An app designed for people to easily access the events, ongoings and photographs throughout the International Year of Light 2015. "I was searching online for an app to download so I could organise my calendar with events in my area. I couldn't find anything so figured why not make something simple and effective so we can all enjoy this memorable year and reach out to everyone who has an interest in lighting!" The app received over 1000 downloads globally and was featured in the lighting press, news stations and magazines around the world. Note: the app was designed for calendar year 2015 and no longer exists. Thank you to everyone who supported it and we are glad you enjoyed using it!